Butler Brothers was originally a mail order, importer and jobber, founded in Boston in 1877 by two brothers; Edward Burgess Butler and Charles Henry Butler, the following year brother George Hamblet Butler joined them. Butler did not manufacturer dolls, instead like Sears and other distributors, they purchased dolls from others to sell throughout their many stores, starting with German imports, then made in the USA. Shown is a 1918 Uncle Sam doll, 30" tall, with a composition flange head, molded painted light brown hair, blue painted eyes, closed mouth, excelsior stuffed body, upper arms and legs, jointed with outside disks, composition lower arms. Dressed in a red and white striped jumper with a blue and white star print jacket, black bowtie, light tan shoes, doll is unmarked. Butler advertised a line of large sized character dolls that are referred to as carnival dolls, because they were available through carnivals and fairs, most of these dolls are unmarked, some of the dolls have been attributed to Elektra Doll & Toy Company or New Era Novelty Company. 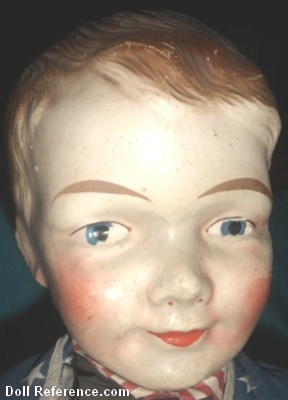 Butler Brothers sold Tam O'Shanter doll 1893; solid white bonnet head, all stone bisque doll. Louis Amberg dolls, Averill dolls; Grumpy doll, Sunny Girl doll, Sunny Boy doll, American Beauty doll, American Countess doll, American Girl doll, Effanbee dolls; Mama dolls, Baby Catherine doll, Baby Grumpy doll, Bubbles doll, Patsy doll, Gem Toy Co Mama dolls, Gebrüder Heubach 1907-1914 Dolly Dimple doll, Ideal Flossie Flirt doll, Butler used the trade name of Marvel found under the Kestner crown and ribbon streamers on kid bodied dolls. Butler was at sometime the exclusive agent for Jessie McCutcheon Raleigh dolls 1916 to 1920, Mammy doll ca. 1926, Yama Yama doll (a boudoir Peggy doll in clown suit) 1927 and Regal Kiddie Pal dolls 1928+. 1907-1912 Matlock Patent Washable dolls, Pauline doll, Ruth doll. 1909 Kämpfe & Heubach Alice doll. 1913-1914 The Wide Awake Doll, all bisque smiling Kewpie. & doll mark Germany, Germany P.
1928 Dainty Miss. (Mama doll), Sissie doll made by Cameo. 1929 Tootse doll also sold at Sears. All Rubber dolls size 4 1/2 - 10" tall, Aunt Sally doll, Aviator doll, Babbit Boy doll, Baby Bunting doll, Baby Buttercup doll, Banker's Daughter doll, Banner Kid dolls, Beatrice doll, Boudoir dolls, Buster Brown doll 11 1/2", Dorothy doll, Esther doll, Special Doll with a composition head, ABC Toy Co dolls, 1918+ large sized Carnival character dolls, plus many other dolls.